I can really feel for the Dead. In my quest for recreating that Wall of sound era sound I have painstakingly recreated my own personal albeit Spinal Tap version of the wall of sound. Like the Dead, It has nearly bankrupt me hence they all must go. PM me for details if you're interested. 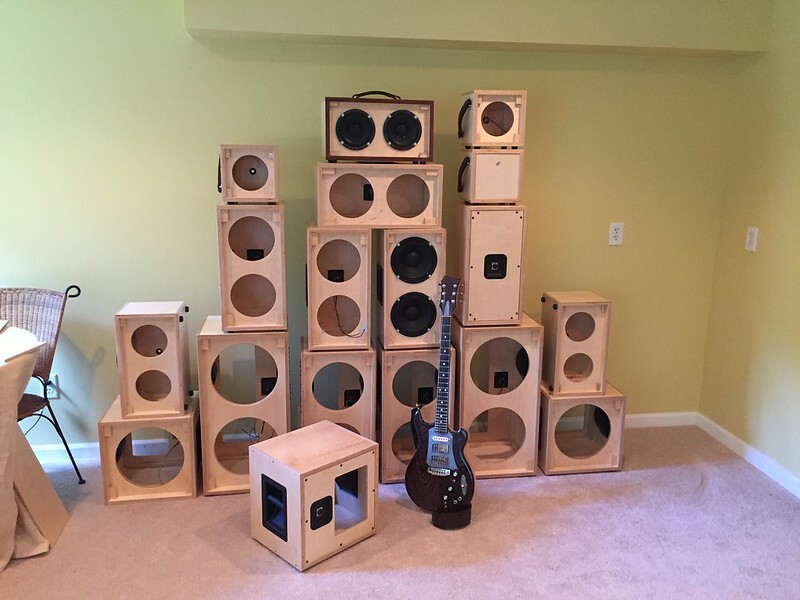 This batch has the usual 2x12’s and 1x12’s as well as 2x10’s and if you are a Quilter, Henriksen or other compact SS amp owner I have 1x6, 2x6 and 2x8’s. While not exactly the usual Jerry cabinets the small ones with a Quilter and either Eminence Alpha6’s or Celestion TF0818's do a really nice job for such a small package and still handle 200 watts. Ideally I’m not shipping the larger ones but I’m always up for meeting local Heads. If you’re anywhere within a few Hours of Sandy Hook CT (NY, NJ, CT or MA) we can work something out. These cabs look great. What are the overall dimensions of the smaller "practice" cabs? Do they come with any sort of clips for the speakers? The 12” ones will have the usual aluminum HT style clips. I’m working on a clips for the 8’s and 10’s but they’re not included. the e110’s look a little odd with them in my opinion. While I can make them smaller, they’re purely for show. But hey they’d make for cool bookshelf home audio speakers. All are 13 ply B/BB grade 13 pky baltic birch, rabbeted corners, glued, dowelled and braced internally. Baffles are baltic birch 3/4” for 10’s and 12’s and 1/2” for 6’s and 8’s, glued in dado’s on all sides. Backs are partially open for 10’s and 12’s, closed for 6’s and 8’s. All have magnetic birch covers. All vinyl sealed and 4 coats of medium sheen lacquer and have rubber feet. 10’s and 12’s have exact hardware as HT cabs including Neurtrik locking jacks. 8’s have single side mounted recessed handle, and 6’s have letherette strap handles. I’ll wire them to series or parallel . More pictures here (but no clips installed yet and magnets just showed up yesterday. Do have the approximate weight of the loaded 2x8 cabinet. I would be interested in one of the 2x8’s. mutant_dan wrote: I would be interested in one of the 2x8’s. augustwest1 wrote: These cabs look great. What are the overall dimensions of the smaller "practice" cabs? Do they come with any sort of clips for the speakers? I can say they look just as good in person! Just picked up a 1x12 and it looks great and built like a tank. They fit both my K120 and Beyma Liberty. Anthony (ac4468) was great to deal with and got the cab out to me in 2 days! Mental note.... Next batch make mostly 1x12's! Plus 1 on these cabs looking even better in-person. My 1 X 12 is absolutely beautiful, and flawlessly crafted. Anthony even delivered it to me for a very nominal fee (and I don't exactly live around the corner from him). I couldn't be happier with mine -- and Anthony was fantastic to deal with. Great member of the community. Any racks in your collection? I will PM to ask about availability, but wanted to publicly state that just seeing this made my week. That is just awesome. Thanks. No racks but still a handful of cabinets. I have 2 2x12's, 1 2x10 as well as a bunch of smaller 2x8's, 2x6's.